Spotify is splashing out millions of dollars as it tries to move beyond music into the growing podcast market. The music streaming service has bought Gimlet Media, behind a string of popular podcasts including Reply All, and podcast publishing platform Anchor. The Swedish firm has also pledged to spend $400-$500m (£308m) this year on further podcast-related acquisitions. Midia Research music analyst Zach Fuller said Spotify was trying to become the "Netflix of audio". He said the move was aimed at putting it ahead of music streaming rivals like Apple Music and Tidal, as well as allowing it to earn more from advertisers. 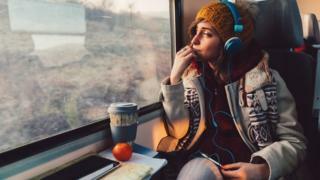 "Going into podcasts, a longer form of content, allows Spotify to keep listeners for a longer period of time, which mean they can earn more from advertisers, and advertisers will only be too happy to pay because they're happy to have a new digital player that isn't Google or Facebook," he told the BBC. "Podcasts are less costly to produce than paying major record labels for rights to use songs on their platform, which they still have to do," he added. Spotify said it wanted Gimlet for its podcast studio, while it said Anchor, which allows individuals and companies to create and publish podcasts, would bring a growing number of new content creators. Separately, Spotify announced that it had achieved its first quarterly profit, and for the first time in the firm's history, its operating income, net income, and free cash flow were all positive. The latest forecasts from consultancy PwC show that online audio advertising for traditional AM/FM radio broadcasters will grow by 7.8% between 2017 to 2022, and it is expected to be worth $2.2bn by 2020. And around a fifth of people in the US, UK, Canada and Australia aged between 20-34 cohort listen to podcasts, separate figures suggest. "Advertisers are now looking in the digital advertising landscape and almost all the growth is taken up by Google and Facebook. "If Spotify can demonstrate that podcast advertising provides a meaningful return on advertisers' investment, then they will reap the benefits of that," said Mr Fuller.